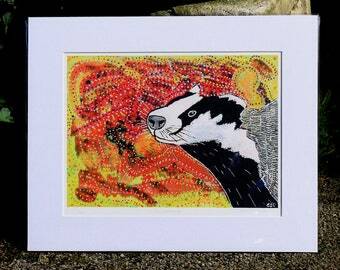 Announcement Colourful wildlife art and quirky nature inspired jewellery handmade using wood, stone, canvas, paper or my own photography, hand painted which makes my pieces one of a kind, the perfect gift for someone special, for someone who has it all and is hard to buy for or maybe something unusual and special for yourself. 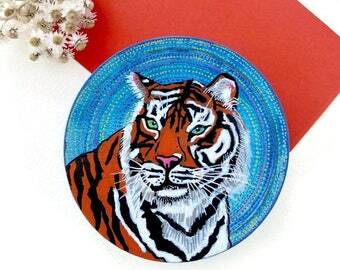 From necklaces and earrings through to original paintings on a whole host of surfaces - using bright bold combination of colours such as blues, reds, purples and greens and more importantly the subjects themselves - wildlife! 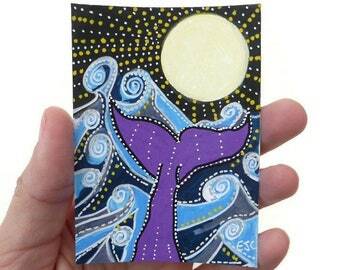 I particularly love to paint whales, foxes, hares and my new favourite, deer! I’m always painting and when I’m not, I’m outside with my camera soaking up the natural inspiration which surrounds us all. Thanks so much for dropping by! 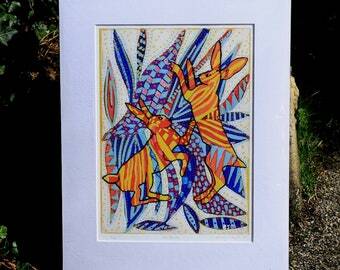 Colourful wildlife art and quirky nature inspired jewellery handmade using wood, stone, canvas, paper or my own photography, hand painted which makes my pieces one of a kind, the perfect gift for someone special, for someone who has it all and is hard to buy for or maybe something unusual and special for yourself. 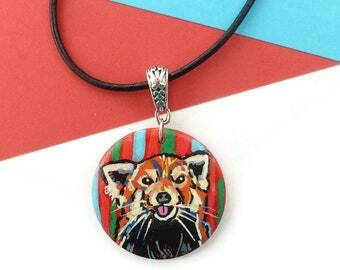 Such a cute, well made necklace! The detail is so nice with little flowers all over. Very pleased! Shipped fast with good communication. Beautiful & perfect. Love everything about it from the colours, shape & size to the general style. Also love the feeling of freedom it seems to convey. My items were posted very promptly & arrived to opposite side of the world in just 8 days flat! My pre-Christmas order hitched a ride on Santa's sleigh but not sure who this lot rode with. One of the Thunderbirds rockets maybe?! Lovely little pendant. 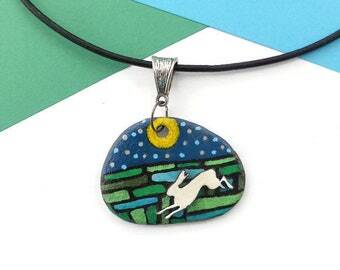 I chose this one almost as an after-thought & very glad I did as it's different to other horse necklaces I've seen. It's simple yet arty & so lightweight & comfy to wear. Very pleased to add it to my little collection. 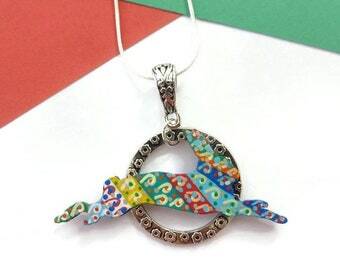 Unique & adorable pendant. I love the kind of items that seem to tell a story & this one appears to be saying 'No matter how turbulent it gets, fix your sight on your North Star & just keep on swimming'! Very cool little creation. Love it. Currently illustrating a painting a day - look out for them in my shop! 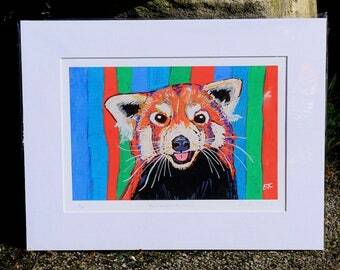 Original & limited edition prints! 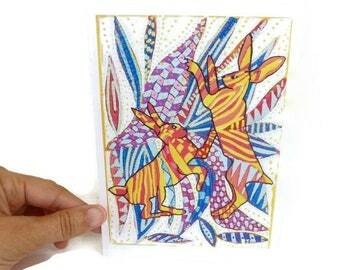 Brand new greeting cards in my shop! I always have so much on the go all the time, and work in the conservatory, the best light in the house! The top left picture is my 'Tray of Tricks' - it motivates me to get to work, so many ideas already there! 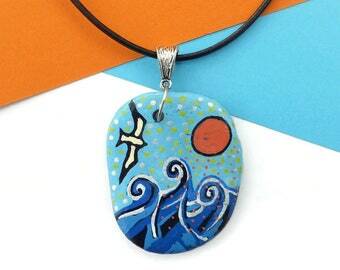 Hand Painted Jewelry, Pebble Art, Photography Jewelry, Colourful Jewelry, Wooden Jewelry are just some of the things I do! 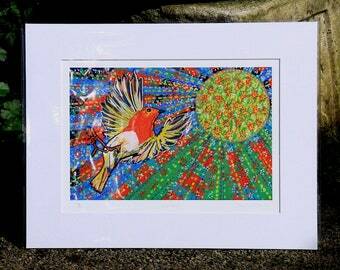 Gifts for people, gifts for yourself, art lovers, nature lovers - ahh robin lovers! See below! My name is Emily and I am a prolific maker! I am so addicted in what I do, that, I just can’t stop and I doubt I ever will! I live in the beautiful wilds and the inspiring place of North Devon, UK - a place I would spend many happy weeks on family holidays in the Summer, only to be incredibly lucky to move down to my holiday destination around 8 years ago and set up home and garden! I am a wildlife photographer and a fine artist - I make some of my best pictures into jewelry - necklaces, earrings and bracelets. 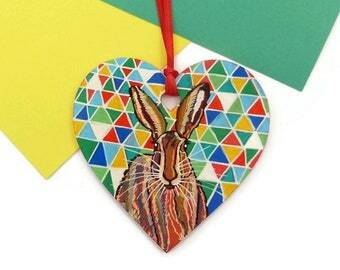 I also hand paint jewellery items too, mainly on wood, sometimes on metal and one day on ceramics! I have many, many items planned! I don’t have to go far to get my inspiration, I have an awesome coastline on my doorstep, a fabulous wild and lonely land of Dartmoor which I can see from my window, a beautiful patchwork of rolling fields from my garden and in my garden a whole host of wildflowers and wildlife - including a robin called ‘Louie’, who’s the last son of ‘Larry’ who took the name of my business - Larry was a hugely important influence in my life, he got me through the dark days after losing my mum to cancer, he taught me how to live and find happiness in life again - I knew him since he was a fledgling (I knew his dad too) and I followed his whole life until his end, he was predated and only one of his chicks survived - ‘Louie’. It’s been a huge love affair, a robin soap opera played right before my eyes and I have become emotionally involved with these incredible creatures, I have had a front row seat! 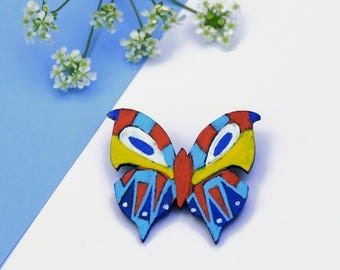 At the moment I am addicted to painting on wood - I’ll always produce my photography jewelry as I photograph outside every day - but when the weather is wet and I can’t get out there, I take brush to wood, using lots of colour, I design and create and that’s when I am at my most happy! 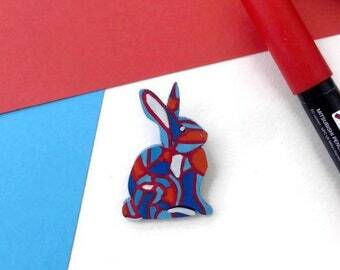 So to be able to bring you all something to be able to buy from my shop is truly satisfying and I hope you love the originality and the creativity as much as I do - not one item the same, every painting unique! Well, like you & me! (& Louie!). Sign up for my Larryware Newsletter for exclusive offers, discounts, downloads and everything else to make you smile! I shall never spam your inbox and you will only hear from me once, perhaps twice a month! You can unsubscribe at any time! Please copy and paste into your browser this link and follow instructions, you will then receive an email for you to confirm your subscription - if there is any problem please send me a message - thank you so much! Hello, I am Emily. I live in North Devon, England amongst all the nature which I love and am inspired by. I'm a gin lover! I also love keeping fit, long walks in the countryside, seaside trips and lovely days spent out and about with my camera. If Larry Robin could indeed speak he would have an awful lot to say. He is the inspiration behind everything I have and will have ever created. He is my muse. He started my shop. His name adorns my shop 'Larryware'. He IS Larryware. Humble bird! A firm of professional printers local to myself. They design, print, do signs, websites and office supplies. I gave them my 13 photographs of Louie, plus the text and they printed and put together my calendar for my business of Larryware. All my greeting cards and limited edition prints are printed from here. Hello & welcome to my shop of the feathered beauty that is one Little Larry Robin (Larryware), a dear bird that lived in my garden in Devon, England and inspired me to open an Etsy shop. I took his photograph every day for the 2 years I knew him, from fledgling all the way to adulthood, I have about 10,000 photographs of Larry in my archive! Also I make handmade original photography jewelry in silver plated and antique bronze bezels using a whole host of other subjects from birds to flowers to trees to nature scenes and in a whole manner of shapes and sizes from square to round to 12mm to 25mm. 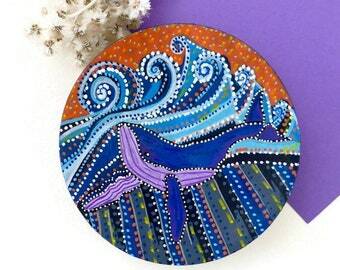 You will also find one of a kind (OOAK), Ready To Ship hand painted handmade round and square pendants necklaces of abstract paintings in acrylic and gouache paints (gouache is like watercolour, but heavy bodied). Plus to add to my shop I have started painting on wood, stone and canvas. I hope you enjoy looking around my shop and if you would like to contact me, please don't hesitate to do so. Each piece is handmade by me & so is unique. I will take great care to make sure that your package arrives safely and quickly. If anything is lost or damaged in transit, I will try & replace with something very much like you ordered, as some of my pieces are unique & so can't be 100% replaced exactly. Please note, I do not accept custom made returns and shall not be able to refund you if you wish to cancel or change your mind. If it is damaged in the post, please provide me with clear photographs of the damage and I shall try and make a new item as close to the original as I can. CANCELLATION - if you feel you've made a mistake and no longer need it, contact me within 2 days of purchase and send it back to me within 30 days of delivery. REFUND - I will refund purchase price and the original delivery P&P but you will be responsible for return postage and packing. I will not refund unless the item has been sent back to me. Please note that custom orders cannot be returned nor refunded. Please get proof of postage for returns, as otherwise I will not refund for items lost in the post when being returned to me. IF IT'S FAULTY - Tell me and return it within 21 days after receipt of the goods. You will receive a refund to include the cost of return postage - alternatively I will fix the item if you would prefer. IF IT GETS LOST IN THE POST - I always use Royal Mail Signed for in the UK and Tracked and Signed Worldwide - if there is a delay in reaching you, please don't panic, especially around busy times like Christmas, the postal service tends to be very slow. Please allow 28 DAYS for delivery at any time to anywhere in the world. Payment may be made via Paypal. If you haven't a Paypal account, you can pay via Paypal using your credit card. Click on Paypal at checkout, choose the “I do not have a Paypal account” option and follow the instructions. I also use Direct Checkout which gives you even more options to pay with! Custom Orders - I would prefer to be paid up front. Depending on how soon you'd like your order, my turn around is approximately 7 working days and I'll keep you informed every step of the way! When you contact me and we discuss and conclude details, I would then list a custom listing just for you and will only start making once payment has cleared. Thank you for your understanding. Please note, I do not accept custom made returns and shall not be able to refund you. I ship worldwide within 1-3 business days after payment. Please make sure to complete your transaction immediately after purchase; If after 3 days of purchase your payment has not been received, I will send you an email. Packaging: Each jewellery item will be placed in a pretty organza ribbon gift bag and then wrapped again in a patterned paper bag. I send all of my items in bubble light brown packages. If a canvas, stone or painted wood, depending on the size, I'll either place it in an organza gift bag or wrap it in bubble wrap for protection. Postage - All of my items are sent via Royal Mail Tracked in the UK, or Tracked And Signed for worldwide. Elsewhere - (depends the direction of the wind!) I mean... 3 to 5 days in Europe & up to one month, perhaps sometimes 2 months worldwide - so please be patient. If your ESTY and PayPal address are different, please let me know in the message to seller which one do you prefer me to send your purchase. Larryware will only use your supplied shipping and billing addresses along with your contact information for the purpose of communicating with you regarding your order process. Larryware will not disclose or share any of your supplied details with any third-party other than to a United Kingdom Government Agency should it be specifically requested. Your data is stored safely (password protected) and can be removed at any time by contacting me. At the moment I am not offering any custom or personalized orders - although if you really like my work and have an idea for something, then please do contact me and I'll get back to you as soon as I can - I am always open to offers! All of my listings come with the exact size - but for any reason they've been stated incorrectly and I come across a wrong sized chain or other length size, I shall contact you. Please note, none of my items are good to eat, so please keep them away from children and pets. All of my items are protected from the elements - a drop of rain or snow is perfectly ok, but please remove all my jewellery when you bathe, shower or swim. Also please do not keep any of my items - from jewellery to original art in direct sunlight - all the varnish in the world will not protect colours if they have too much sun exposure. All of my items are placed in a pretty ribbon organza bag, and then into a colourful striped paper bag - occasionally if the item is travelling across the world, I wrap my items in an extra layer of bubble wrap, just in case. 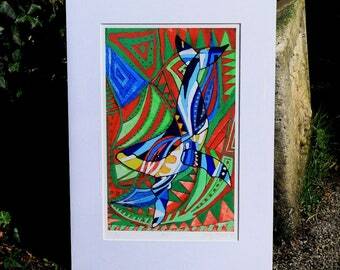 If you have bought a piece of original art, I now send out a 'certificate of authenticity' which features a picture of a robin, the certificate and then another note to say thank you for buying handmade.